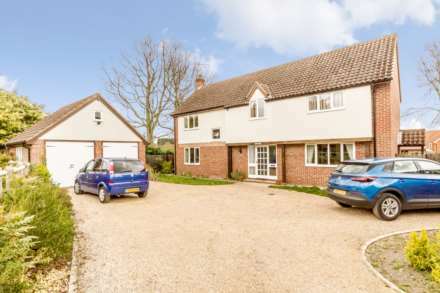 Situated in the popular well serviced village of Necton, Longsons are delighted to bring to the market this very well presented, recently refurbished three bedroom detached house. 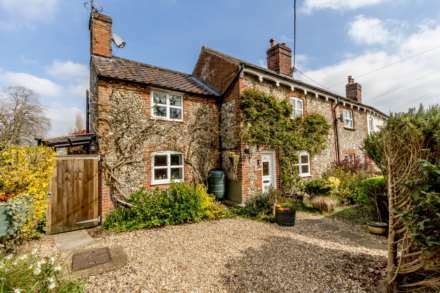 The property has been freshly decorated throughout and boasts recently fitted new kitchen, bathroom and cloakroom suite, two reception rooms, garage with remote control electric roller door and gardens. Briefly, the property offers entrance hall, lounge, dining room, kitchen, cloakroom with WC, three bedrooms, bathroom, garage with electric roller door, parking, front and rear gardens, oil central heating, double glazing. Double glazed entrance door to front, stairs to first floor with storage cupboard below, radiator. Wash basin, WC, double glazed window to front. Feature fireplace with brick surround and tiled hearth, double glazed window to front and side, two radiators. Patio doors opening to rear garden, radiator. Fitted kitchen units to wall and floor, worksurface over, stainless steel one and a half bowl sink unit with mixer tap and drainer, electric oven with ceramic hob and extractor hood over, space and plumbing for washing machine, central heating boiler, double glazed window to rear with external window shutter, double glazed entrance door to side with external shutter. Obscure glass double glazed window to front, cupboard housing hot water cylinder with shelving. Bathroom suite comprising bath with mixer shower over, WC, wash basin, fully tiled walls, radiator, obscure glass double glazed window to side, access to loft. Remote control electric motorised roller door to front, electric power and lighting, water tap, personal door and window to rear. Front garden laid to lawn, driveway with parking leading to garage door. Enclosed rear garden laid to lawn, shingle seating area, garden shed, greenhouse, gated access to front, wooden fence to perimeter.